A 14-year-old kid commandeered his grandfather's Hyundai Veloster on Saturday, blazing through a park full of children and generally terrorizing Syracuse, Utah. His reign of mayhem was only reeled in when a citizen plowed into him with a Ram pickup. Miraculously, everyone walked away uninjured. You can also watch the original Fox13 coverage right here as well; it's pretty much the same but their anchor was a little less confused. The vigilante roadblocker is generally being celebrated by local news, but he was definitely operating in a moral grey area by taking such aggressive action. If he'd hit the gas a little harder and killed the kid behind the wheel of the stolen Hyundai, there'd be no way to know whether or not the tragedy caused outweighed what may have been prevented. That said; from what I can see in these clips I think the Ram driver made the right call. Causing an accident to avoid a hypothetical one was a big risk, but the kid in this Hyundai was putting way too many people in serious danger to be allowed to carry on. And since the occupants of both vehicles did walk away, it seems like road-blocker had enough skill with his truck to crash it in relative safely. Or he got lucky. The 14-year-old has been taken to a "juvenile detention center," and it'll be interesting to find out what happens to the guy with the pickup. Not to mention what the boy's motivations were for causing such insanity, and whether or not he was trying to hit people or just couldn't see over the steering wheel. 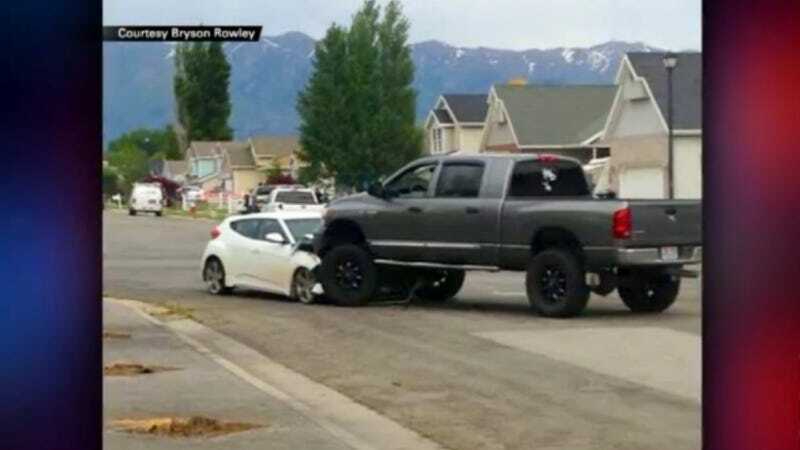 Think the Ram was put to good use, or was the guy in the truck just as reckless as the kid reenacting GTA?